I have to be honest, Portugal was never high on my list as a place to vacation.…I always felt like ‘I will get there when I have exhausted all other travel options.’ I cannot tell you how dumb that line of thinking was. I just got back from a 2 week road trip through the country and I have to say, it turned out to be one of the greatest trips to Europe I have ever had. I started in Lisbon with my husband, and drove the entire perimeter of the country – overall about 1,300 miles, much more than I had anticipated. Greg ditched me after 6 days for work reasons and I spent the rest of the time trying to read the guidebooks, street signs, and navigate the one way streets on my own. I can’t lie to you, there were some significant moments of stress, but in the end, the amount of personal satisfaction and sense of adventure far outweighed the strange encounter with the goat herder, driving the wrong way on a busy city street and the countless hours of trying to find last minute lodging in a strange city in the dark. As I mentioned in an earlier post, I had a difficult time planning the trip as very few of my friends and colleagues have been to Portugal. I was at the mercy of the Lonely Planet guides to lead me on and off the beaten path. I don’t know why, but I am always fearful of relying solely on a guidebook, probably because I have had some bad experiences in the past. I have to say, the peeps at Lonely Planet did a pretty good job highlighting the practical tips, lodging choices, and key experiences. As a reference point, some of the key cities I visited were, Lisbon, Sintra, Cascais, Aveiro, Obidos, Coimbra, Borcelo, Porto, Alamante,Manteigas, Marvao, Albufeira, Sagres, and Zambujeira do Mar. What did I learn about Portugal? It is a GORGEOUS country and is far more diverse than I ever imagined – Long, wide, soft sand beaches,dramatic cliffs, mountains, old world charm, historical ruins, castles, sophisticated cities, and vineyards. It is an easy country to navigate in a car until you get to a city (regardless of size), then the street signs become a little less visible. There are rest-stops with clean gas stations and restaurants about every 35 to 50 miles. There are A LOT of tolls so I was grateful to have an ‘EZ Pass’ toll tag. Saved me from digging for Euros at the toll stations. The radio stations are the BOMB. They play 2 or 3 English songs (Adele, Florence + the Machine, Michael Jackson, CCR, Rihana, Flo-Rida, etc) and will follow up with a Portugese song or 2. I have never danced or sang in a car this much in my life! It is clean and very tourist friendly. You won’t see mounds of trash piled on the side of the highway and all of the lodging I found was extremely clean and affordable. There are also tourist offices in every town to help lead you down an interesting path if needed. What were the highlights? There were so many it was hard to pick but I managed to dig deep. Porto has become my new favorite European city – it is an old, authentic city full of maze-like alleyways and colorful buildings. The photo and exploring opportunities are endless. I was never a fan of Port wine until I visited this fine city and visited one of the tasting rooms – Ferreira. I ended up buying a vintage bottle of Port I can drink in 10 years. I will be close to 60 years old when it is ready for consumption – probably not my finest decision. The view of Porto from that side of the river is stunning, if you miss it you will regret it. Driving solo through the Douro Valley wine region on a crisp fall day with blue-bird skies has to be one of the most liberating experiences of my life. I rolled down the windows and cranked Dirty Diana on the radio (the Portuguese radio stations love Michael Jackson!). Because I just missed the grape harvest season, the roads were empty and I felt as though I had the entire valley to myself. The views of the terraced vineyards were amazing and some of the most beautiful I have ever seen. The hotel Casa da Calcade in Amarante was my overnight stay in this area. Trip Advisor gave it high marks, but I found it to be average. Take into consideration they gave me the handicap room on the lower floor so it was no frills and dark (Why do hotels do this??). I did have an enjoyable glass of wine on the patio near the pool with the scent of apricots in the air – perhaps that made up for the dingy room. The velvety green mountains in the Serra da Estrala provided me with the feeling of home in Colorado, only with quaint whitewashed villages nestled in the valleys of the 5,000 ft. mountains, no fast food chains and few gas stations. Given I almost ran out of gas in the middle of this grand terrain, I would suggest ensuring you have a full tank prior to making the drive. I know what you are thinking – don’t ask, it’s embarrassing. If you happen to get car sick, this drive just might throw you over the edge – the roads are steep and winding but worth the discomfort. Every time I turned a corner there was jaw-dropping scenery. I spent the night in a town called Manteigas and hunkered down at the Hotel Berne. It was clean and cost me $35 + breakfast – what’s not to love about that? Standing on the most Southwestern tip of Europe in Sagres was another one of those days that will stick in my mind forever. The cliffs, the blue green waves crashing against the rocks below and the feeling of being on the edge of the earth made it an unforgettable day. 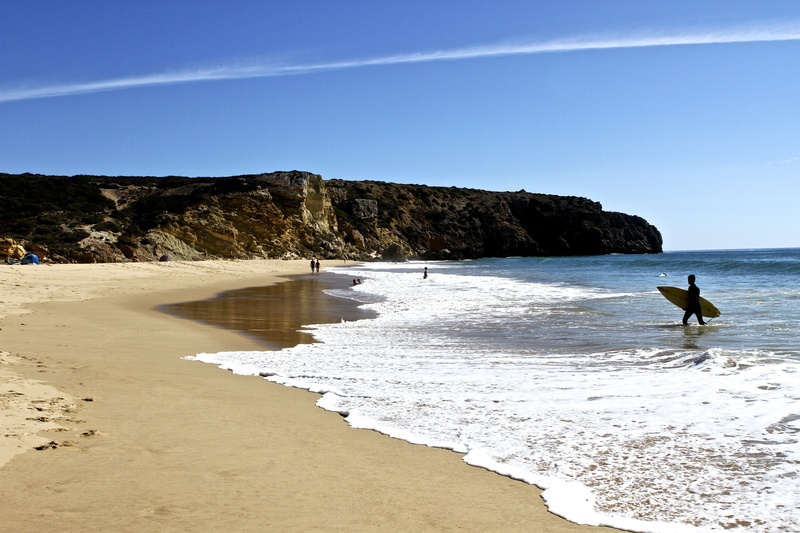 As you can imagine, this part of Portugal is a little touristy (only slightly though), however, the drive between Lagos and Sagres will most assuredly provide you with plenty of off the beaten path beaches to explore. I found 2 that I fell in love with. Praia do Zavial is a little surf beach on an obscure road where I made a last minute turn – there must have been at least 10 surfers off shore waiting to catch the next big wave. 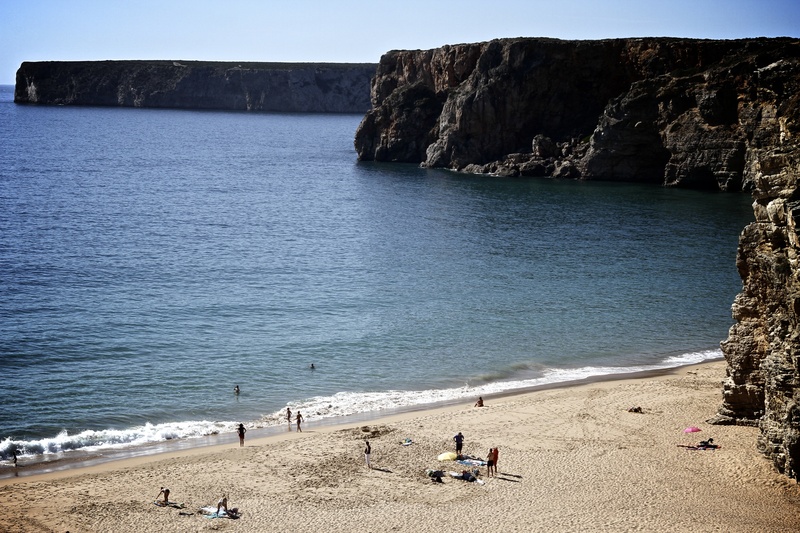 The second was Praia do Beliche where you descend 100s of steps to get to the sand – mainly because it sits between some dramatic cliffs which makes you feel as though you are in total seclusion. It is so gorgeous, I could live there – right on the beach. Apparently you can also explore some of the nearby caves via a kayak or canoe. My crash pad in this area was in Albufeira which I would not necessarily recommend to visit (the town is unremarkable), however, there was an awesome Sheraton Pine Cliffs Resort there that I got for free thanks to my Starwood American Express points. I didn’t leave the compound for 2 days and thoroughly enjoyed the beach and sunsets there. The only 2 cities I could have passed on were Coimbra and Aveiro – I felt the guidebooks overrated both of these spots. Coimbra is a relatively large city for Portugal and I did not find the university component to be the most interesting. Apparently the way to see this city is on foot which I did not do. Perhaps I missed out on a gem. Aveiro they call the ‘Venice of Portugal’. Again, maybe I missed something but the best thing I saw here was a girl walking her cat on a leash. Come to think of it, that was the highlight of the entire day so perhaps the day in this city was worth it! The other cities visited as noted above I would recommend. The guidebooks cover those pretty well, they just didn’t make it to the top of my personal highlights list. If you don’t have Portugal on your bucket list you should. I could literally go on and on about things I found interesting but if I put everything in the blog, it would be 5,000 words long! Jump on the Life Bus and take a road trip through Portugal. I think it is one of the best countries to explore in a car!